You know this thing about Rainbow Magic Games? Girls love fairies, and we are sure that they are also going to love the fairies from the Rainbow Magic Games category on our website! In these Rainbow Magic Games you will have the chance to enter the fairyland and do all sorts of fun things with the fairies, and we are sure you will enjoy each of the games here, so you should go ahead and play them right now! In Rainbow Magic Games you can find 6 games that we've published for these kids and childrens that are interested to play Rainbow Magic Games, this game gategory have been created on 03.06.2016. These games with Rainbow Magic Games have been voted 1 times and the avarage of vote is 5.00 stars. We advice you to play the last flash game from Rainbow Magic Games, Rainbow Ruby Puzzle that have been published on 20.01.2017 06:02. Rainbow Ruby Puzzle its a part of Rainbow Magic Games category and until now its played 1154 times. Try it now on Cute-Games.com! 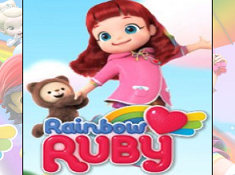 If your like the Rainbow Ruby Puzzle game you can write a comment in the game page. Recommend this game to your friends if you like it! 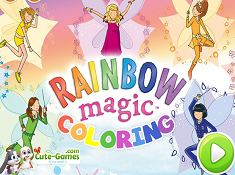 Rainbow Magic Coloring its a part of Rainbow Magic Games category and until now its played 6550 times. Try it now on Cute-Games.com! If your like the Rainbow Magic Coloring game you can write a comment in the game page. Recommend this game to your friends if you like it! 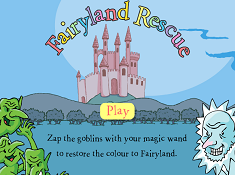 Fairyland Rescue its a part of Rainbow Magic Games category and until now its played 4186 times. Try it now on Cute-Games.com! If your like the Fairyland Rescue game you can write a comment in the game page. Recommend this game to your friends if you like it! Create Your Own Fairy its a part of Rainbow Magic Games category and until now its played 6978 times. Try it now on Cute-Games.com! If your like the Create Your Own Fairy game you can write a comment in the game page. Recommend this game to your friends if you like it! 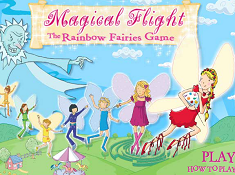 Magical Flight its a part of Rainbow Magic Games category and until now its played 5311 times. Try it now on Cute-Games.com! If your like the Magical Flight game you can write a comment in the game page. Recommend this game to your friends if you like it! Rainbow Magic Hide and Seek its a part of Rainbow Magic Games category and until now its played 4701 times. Try it now on Cute-Games.com! If your like the Rainbow Magic Hide and Seek game you can write a comment in the game page. Recommend this game to your friends if you like it! Find More About Rainbow Magic Games! We invite all girls to start playing the wonderful Rainbow Magic Games on our website right now, as this incredible new category was created just for you, because we know how much girls love stories that revolve around fairies, and we know that even much more than that, they love playing online fairies games, and we think that the Rainbow Magic Games category will manage to fulfill that desire for all the girls looking for the best fairy games on the internet. The Rainbow Magic Games category is a very special one, and we think that there might be some of you who do not know what it is about, so that is why we are going to use this description to make you discover the magical world of the Rainbow Magic universe, and we think that once you discover this great place, you will want to play all the fun Rainbow Magic Games that you can find on this page. Now, the Rainbow Magic Games is pretty special because it is based on the series of Rainbow Magic books, which so far have only inspired one animated movie, an anime one, so if you already know about Rainbow Magic, we think that it must be from the books, rather than the anime. Still, we think that the Rainbow Magic Games category will become a favourite one to all the girls who start playing these games on our website, so we will now tell you about the world, and tell you more about the kind of fairies which you can discover in the books, and with which you are going to be able to play some wonderful Rainbow Magic Games, only here, on www.cute-games.com! Each book in the series showcases some kind of fairy, telling us more about that fairy and about the kind of fairy she is. That is because in the Rainbow Magic world, there are individual fairies which belong to one category of fairies. For example, we have showtime fairies, like Taylor the Talent Show Fairy, Alesha the Acrobat Fairy, or Leah the Theatre Fairy. Each one of these fairies specializes in the thing said in their title. The Pop Star Fairies deal with things like lyrics, concert, music, make up or dancing. There are Holiday Fairies, one for Christmas, one for Valentine's Day, the Easter Fairy and many others. As we said, each of the fairies concentrate their magical powers toward the thing that they are representing, and we are sure that you will enjoy doing many of these things whilst playing Rainbow Magic Games, only on our website! Among the main characters in the books we can find the two best friends, Rachel Walker and Kirsty Tate, who are two human girls who befriend the fairies, and each one of them lives in a different town. The enemies of the fairies is Jack Frost, who lives in an Ice Castle, and has goblins as servants. Then there are the parents of each of the two girls, the queen and king of the fairies, and of course, the many different fairies which are friends of the two best friends. Now that you got to know more about this wonderful world and the characters in it, we think you might also want to know about the kind of Rainbow Magic Games you will have the chance to play on our website. Well, first of all, we think you already know that the Rainbow Magic Games on our website are aimed primarily at girls, but that doesn't mean they are not also full of adventure and filled with exciting things to do. For example, in the Rainbow Magic Games you will find a game where the fate of the fairyland is in your hands, and you will have to do your best to save it. Fairies have wings, so of course you will find a game where you will fly with the fairies in their magical world. 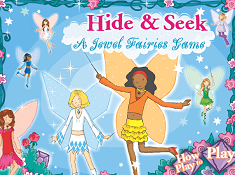 You will have a hide and seek game where you will help them find their missing jewelery, and last but not least, if you like creating things, especially characters, in one of the games you will have the chance to create a fairy to your liking, making it look like yourself, or design it however you want to. All these Rainbow Magic Games on our website and the ones which we will add in the future for you are worth a shot, so we hope that you will try them all out, and we guarantee you that you will never look back, not even once. The Rainbow Magic Games category has been created with care and with the many girls of the world in mind, which is why if you discovered this Rainbow Magic Games category, but your girl friends don't know about it, you should really tell them about it, so they can also visit www.cute-games.com and find and play the best Rainbow Magic Games on the internet!